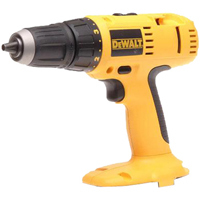 The DW997 hammer features high performance xrp high torque motor, forward/reverse action, 13mm keyless chuck and 16 torque settings. It has a powerful impact action and a 2 speed gearbox. A fantastic, powerful tool. 2 Variable speeds settings for optimum performance in high torque, normal use and high speed applications. 13mm self-tightening chuck tightens throughout operation providing superior bit gripping strength. Electronic brake for added control.